In 1991, I took my first trip to Paris. Before leaving, I had memorized 25 key French phrases. But once there I rarely used any of them as I was too intimidated to ask: “ou est le toilette?” Say something in French and you get a reply with comments that you can’t answer. One of my goals in Paris was to visit the infamous prison fortress, the Bastille — only to be embarrassed by the fact it was not there. There is no trace of any of the original structure. Today, where the prison stood is a public square, Place de la Bastille. To get to Place de la Bastille, I had asked a particular Paris gendarme (police officer) for directions to a certain Metro Station. He replied in English to my French question, saying that many police officers in Paris speak at least two other languages. The events of July 14, 1789 that were to become commemorated as Bastille Day were predecessors to the French Revolution that descended into the Reign of Terror by 1790. Unlike our Independence Day, July 4, Bastille Day marks the start of a civil war — French against other French — whereas ours was a revolution or rebellion by 13 colonies against their owners to create a new nation, the United States. We did not march British loyalists or military to a place of public execution. When the Reign of Terror became known, both the Americans and the British were horrified by the senseless violence of the guillotine. Today, like July Fourth, Bastille Day is celebrated with much national pride, with military parades and fireworks. But most Americans barely know of it and that it is celebrated 10 days later after our July 4th. Bastille Day has always fascinated me with its war-horse-like national anthem: “La Marseillaise” (de Lisle). The words are not known to us as much as the tune is. Some of us know this anthem’s tune from the 1943 film, “Casablanca”, where the character Viktor Lazlo instructs the café orchestra to play it so that it will drown out the strains of a group of German officers singing a kind of Nazi “Horst Wessel”. The French Revolution begins when an armed mob of Parisians stormed the unpopular Bastille prison and released its prisoners, a dramatic action that came to symbolize the end of the ancien régime. The Bastille was subsequently demolished by the Revolutionary government and Bastille Day (July 14) has been a French national holiday since 1880. Following this event, the Reign of Terror would become its most visible symbol of political murder, paranoia, and power struggle. In the beginning, the royal family, most of the nobility, and the higher clergy would lose their heads. Toward the end, the bourgeois revolutionaries themselves would suffer the same fate. No doubt the French Revolution consumed its victims without distinction. How did it all start? Under the old regime, King Louis 16th was the State. Indeed, he actually declared this: “I am the State”! Everyone else was a subject of the King within three orders: clergy, nobility, and others (the Third Estate). There was no national citizenship! The French call their flag “the tri-color”. In the beginning, the colors were represented by a cockade. The flag of the First Republic between 1789 and 1815 was a variation of blue, white, and red. After Napoleon’s defeat at Waterloo, the Restoration of 1815-1830 would end the First Republic and restore the Kingdom of France. 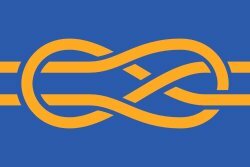 The return of the very unpopular royal flag created public scorn and resentment. Napoleonic reforms provided new legal codes and public institutions had made the French people all too aware of the Rights of ordinary citizens. The tricolor was not restored until the Second Republic in 1848. The colors are symbolic. The white has been always been identified with the royal colors of the monarchy. The many variations of the familiar gold fleur-de-lis (lily flower) pattern has alternated between white and blue fields. The colors blue and red are identified with the Cite de Paris. The red flag appears to have its origins in political radicalism and perhaps in the violence and blood of revolution. It is well-known that the French Tricolore flag was challenged by the red flag after the fall of King Louis-Philippe in 1848 and the proclamation of the Second Republic. Most history books say that the Tricolore flag was “saved” by Lamartine. Alphonse de Lamartine (1790-1869) was a poet and politician known for his Romantic works and his complicated love life. On 24 February 1848, King Louis-Philippe left and Lamartine, member of the Provisory Government, proclaimed the Republic at the town hall of Paris and spoke at the Chamber. The next day, he convinced the mob to support the Tricolore flag. The flag has changed very little since 1830. 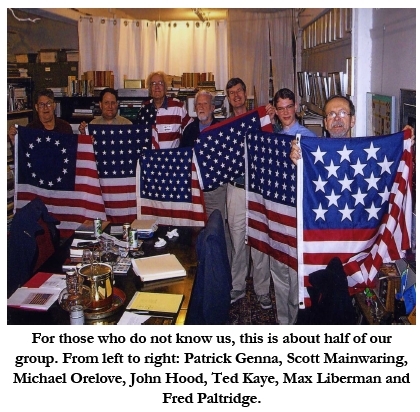 Ted Kaye is hosting this month’s meeting of the Portland Flag Association at 7 p.m., Thursday, July 14, 2011. For details, see the Next Meeting page for details. Hope to see you there! 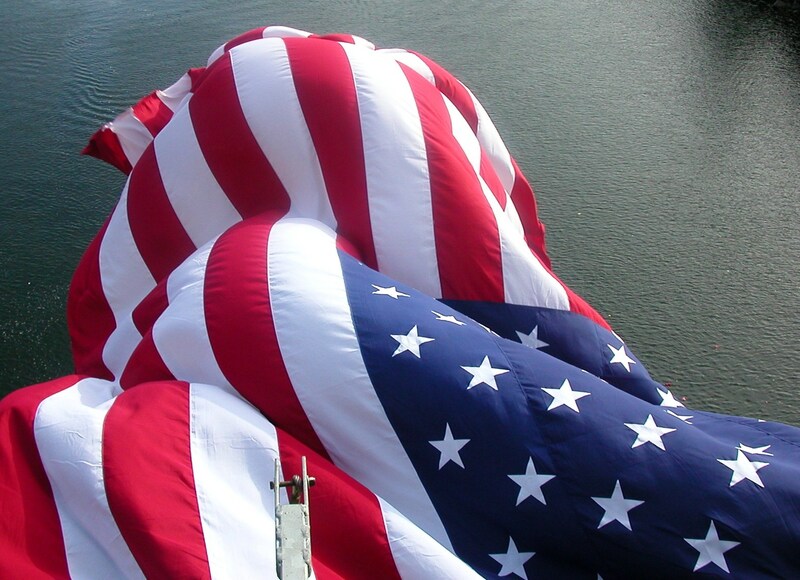 PFA member Ken Dale took this striking image from the Oregon City Bridge on September 11, 2004. It seems an appropriate image for Flag Day (June 14th). The photo is from our annual 9/11 ceremony, a silent remembrance of the September 11 attacks. The City of West Linn originally initiated and planned the event and Oregon City co-hosted it until last year when we held no ceremony since the bridge was under construction. The City of West Linn bought the flag and ODOT placed the hardware on the bridge that holds that flag, and ODOT workers unfurl and remove the flag each year. It hangs for about a week. … The short ceremony usually involved a bagpiper playing ‘Amazing Grace’ on the bridge as traffic was stopped at 9 am; the two communities meeting in the middle of the bridge; the unfurling of the flag; the mayors of the two cities throwing wreaths into the river, and community members, students and others tossing flowers into the river….all wordless, a silent tribute. I always found it very moving and beautiful. One year (it might have been 2004), someone stole the flag, and a students from a charter school in West Linn raised money to purchase a new flag. Author SDMPosted on June 18, 2011 January 18, 2015 Categories PostsTags Flag Holidays, Flag Imagery2 Comments on Happy Flag Day! Who could replace John Hood? The answer, of course, is no one. However, as John reveals in his Open Letter to Members in the latest edition of The Vexilloid Tabloid, someone must replace John as editor of this venerable publication if it is to continue. Over 29 issues John has diligently and with great humor built the Tabloid into one of the finest vexillological publications in this country, but serious health issues are forcing him to step down from serving as editor and publisher. Author SDMPosted on January 13, 2011 January 18, 2015 Categories PostsTags The PFA, Vexilloid Tabloid, VexTab291 Comment on Who could replace John Hood?